As an API provider, you need a way to expose your APIs, educate developers about your APIs, sign up developers, and let developers register apps. Apigee Edge provides you with a Developer Services portal that you can use to build and launch your own customized website to provide these services to your development community. To learn more about developer portal, see What is a developer portal? The following sections describe key concepts that you should understand before troubleshooting issues with your developer portal. An OpenAPI (JSON or YAML) or WADL specification describing your API can be imported into SmartDocs and used to publish API reference documentation to your portal. The API reference documentation appears under the APIs tab on your portal automatically. Developers discover the API documentation through the portal and can make live API requests. As the API requests originate from a browser, CORS (Cross-Origin Resource Sharing) support is needed to allow them to succeed. CORS support is provided by the "smartdocs" proxy on Edge (in the "VALIDATE" org) that acts as the proxy for all SmartDocs requests to the intended endpoint. The "smartdocs" proxy is created when you install SmartDocs. The URL of the smartdocs proxy is exposed as a configurable property at Configuration -> SmartDocs -> SmartDocs proxy URL. You may need to modify this URL if your API is on a private network and live API requests using SmartDocs from your portal are failing. The developer portal stores and retrieves most of the information it displays from Edge including Smartdocs, developers, products, and developer apps. 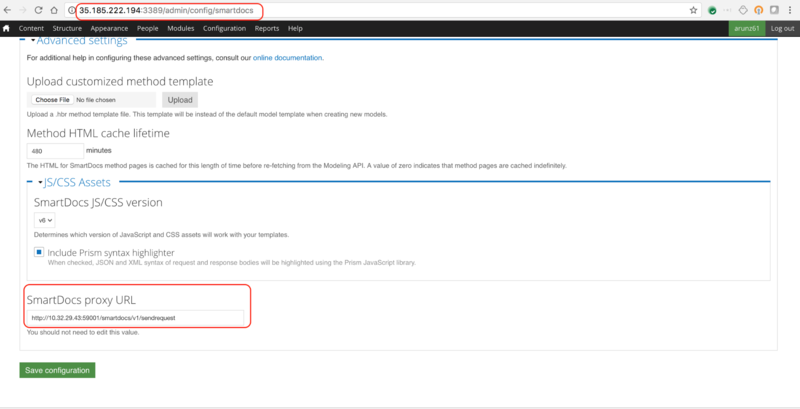 Edge org information and devadmin credentials are configurable by using the menu command Configuration -> Devportal. For more information, see Communicating between the portal and Edge.